The use of humour is often a means of drawing attention to concerns and sentiments that cannot be expressed in other ways. Although there are examples out there which relate to issues that the Big Push Forward is concerned about, ed we are interested in collecting more. Satire and humour are often used to ‘speak truth to power’. The great satirists of history are remembered as having played important roles in obliquely addressing issues through exaggeration, clinic ridicule and rendering the powerful absurd. ‘Rude’ accountability has also been noted as an important means of how people in poverty can negotiate their entitlements and put informal pressures on service providers in contexts where effective formal systems for accountability are absent. 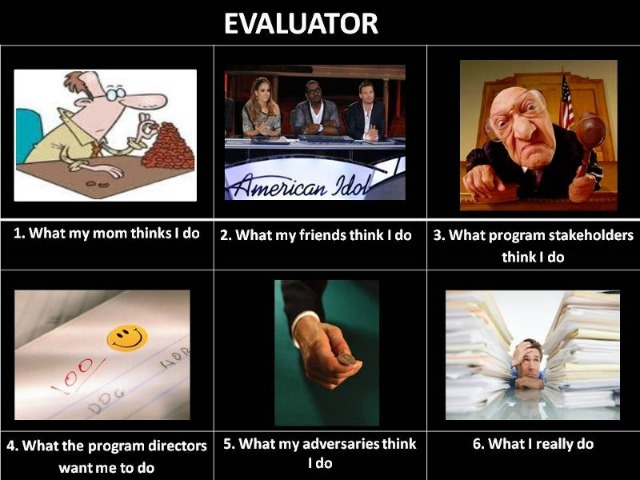 In the world of Results and Monitoring & Evaluation some well known examples of this tendency exist. Andrew Natsios used the alleged letter from Wellington to his bosses in London, as the introduction to his essay on the counter-bureacracy. The Genuine Evaluation website reminded us of the hilarious story of what a consultant’s take on Schubert’s unfinished symphony might be. Dilbert has dissected the world of performance evaluation. 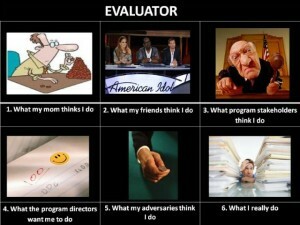 For those that are really into a more technical evaluation humour there is a place for you too! In my previous post on this site I argued that there is a subterranean struggle going in many aid agencies about the results agenda. From my observations it is often accompanied by black humour, satire and ‘rude’ accountability. I recall a few years ago being made part of a ‘select’ staff team that was asked to undertake a ‘Fundamental Review of the Strategic Intent’ of a large NGO, within a few days our important project was nicknamed by people in the agency ‘FROSI’ giving it a slightly comedy bear flavour and subtly undermining its rather pompous title and objectives. What other examples have you come across of the use of humour and ‘rude’ accountability as a means of making a point about how parts of the results agenda need reform, or more debate? Playing the Game to Change the Rules? Reineira on Playing the Game to Change the Rules? William Faulkner on Playing the Game to Change the Rules?